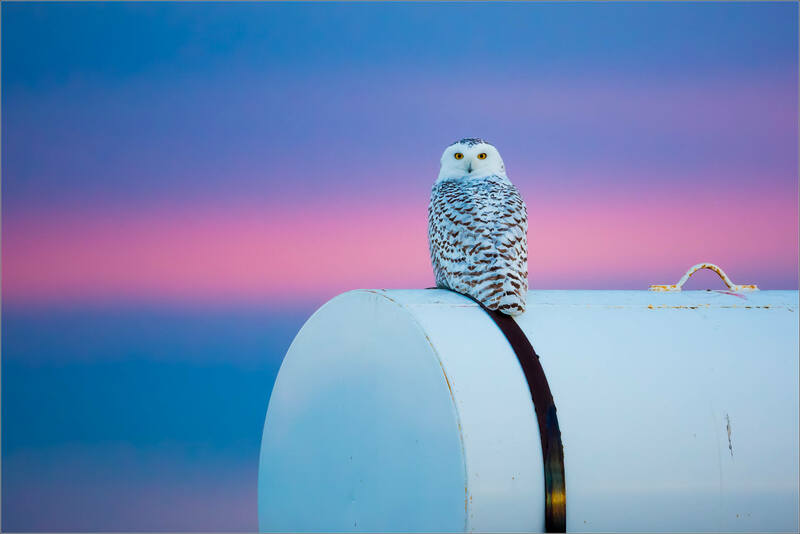 I spotted this Snowy owl perched on this oil and gas installation east of Langdon. She was about a kilometre off the road so I parked, grabbed my gear and headed over. She was scanning to the east while I approached from the west side. As I walked she kept an eye on my, swivelling her neck to watch me infrequently. From a hundred metres away, with colour brushing into the sky as the sun set, I stopped to compose this photograph. I love these birds and I love sunsets – these seemed to be interesting juxtapositions to the storage tank she was perched on. This entry was posted on February 1, 2016 by Christopher Martin. It was filed under Alberta, Owls, Wildlife, Winter and was tagged with alberta, animal, bird, Bubo scandiacus, Canada, nature, Snowy owl, sunset, wildlife photography. Absolutely stunning, I could look at this for hours! What a fantastic image, Christopher. Such beauty! What a marvelous and majestic owl and the shades of sky increase its beauty. You might enjoy my blog, too! I know some of my author friends would love to buy your photography for book covers. 🙂 Here’s my site in case you want to follow. http://www.creativwriter.com Keep up the great work! Nature has some wonderful things to show us. So beautiful. I would love to see a snowy owl in person some time.